The ultimate must have for any traveling nurse. Multiple pockets and compartments designed specifically for the tools of the profession. Water resistant fabric, heavy duty zippers. Large hinged mouth to main compartment. Water and stain resistant durable poly/nylon. Patented. Gave this to my daughter as an early Christmas gift to use at her CNA job. Yes absolutely loves it! Gave to my daughter as an early Christmas gift for her CNA job. She absolutely loves it!! 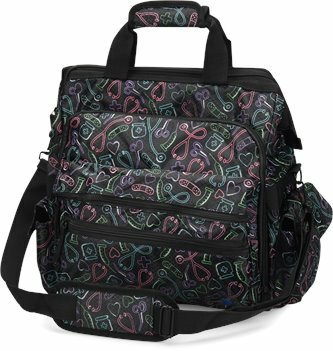 I ordered this bag for my daughter who graduated from Nursing School. I needed the bag by a certain date, so I had it ship UPS 2 day priority. Since the website said it takes 2-3 business days processing PLUS the two days shipping, It was just cutting it a little close to having it on time for graduation, so I emailed the company to see if there is any way to get it out quickly. I was shocked when within an hour of my email, I received a notice that it was shipped via UPS OVERNIGHT. (I only paid UPS 2 day priority - overnight was more expensive) I placed the order in the afternoon and had the product in my hand the next day before 10AM. Unbelievable, I was shocked. This was incredible. Thank you so much shoeline.com. What an incredible customer service. I absolutely Love the bag for work! Fast shipping, excellent price I only give 4stars because there's a defect on the print, seems like there was a wrinkle when silkscreened that affected the image. It's at the lower area, so I don't mind but if you're a picky buyer like I may be at most times... You wouldn't like it ?? I’’m a Home Care RN this bag is the perfect size for my laptop and medical supplies. Besides that its adorable. The color said green but mine is more of a "wet sand" color. It holds everything that I need with room to spare.